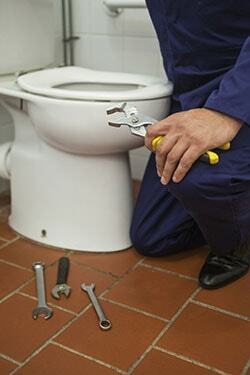 Do You Need to Replace Your Toilet? Did you know that toilets have a lifespan and can expire? Most models are meant to last for 10-15 years, so if you moved into a home that hasn’t been renovated since the early 2000s, it may be time to think about getting a new toilet. If you’re experiencing chronic issues with your commode, read on to learn about the warning signs that say it might be time for an upgrade. If your toilet is constantly clogging and you find yourself having to use a plunger or a plumbing snake on a weekly basis, it could be your toilet itself that’s to blame. Older models often don’t have a very strong flushing capacity and by investing in a new toilet, you can not only give the plunger a rest, but thanks to new water-saving models, you could also save quite a bit of money on your water bill too. When you clean your toilet, make it a habit to inspect the condition of the porcelain. If you ever notice a crack beginning to develop, this is a sure sign that it’s time to call your expert Maryland plumber to come in and replace it. Cracks will only get worse with time and even if they’re not leaking yet, it’s only a matter of time before they’ll start. Sure, you might be able to get your old toilet into good working order if you change the flange, replace the flusher, install a new flapper, and invest in a new floater bulb, but is all that work really worth it for an old and outdated toilet? IF your toilet is going to end repairs that will cost you time and money, you may well be better off simply purchasing a new one. This entry was posted on Thursday, February 18th, 2016 at 4:24 pm. Both comments and pings are currently closed.